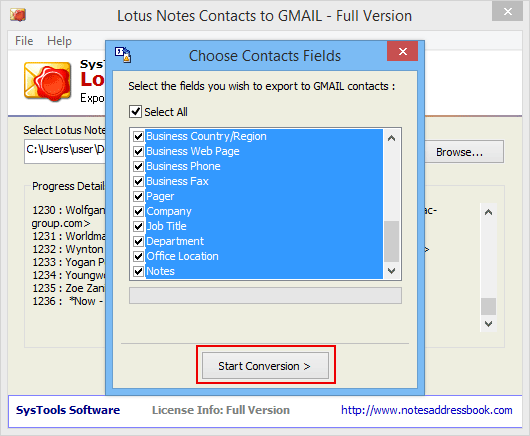 Lotus Notes Contacts to Gmail Converter tool is to convert Lotus Notes NSF file contacts into CSV file format for Gmail contacts. Tool easily scans and loads multiple contacts from the Lotus Notes address book. It supports all the editions of Windows Operating System from Windows 10 and below editions with support for both 32 and 64-bit. Load and Export multiple contacts from Lotus Notes Address Book. Unlimited conversion of names.nsf file Contacts. All the fields of Lotus Notes contacts into CSV file are exported and saved. 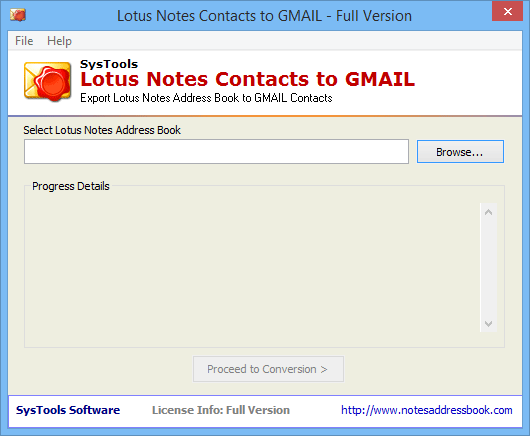 Installation of Lotus Notes is compulsory in the computer system for the conversion of Lotus Notes NSF file into Gmail CSV. CSV file can be added into Gmail with the option to import the file. Once the names.nsf file is added the tool automatically begins the scanning of the file. All the contacts contained in the file will get scanned and it will be indexed. After this the tool loads all the contacts and users can proceed further to convert them into Gmail CSV. Lotus Notes NSF file contacts to gmail loads all the fields contained in the IBM Notes Contacts and allows the user to check or uncheck its fields like First Name, Last Name, Middle Name, Email Address, City etc. After that, the tool will export only the selected fields from the names.nsf files into CSV file format. After the user has added the names.nsf file and has selected all the desired contacts fields NSF Contacts to Gmail saves the CSV file on the user’s computer system. To open and read the CSV file click on the command "Open Converted Contacts File" from tool panel itself. After the CSV file has been created users can import it from Gmail. To do this the user needs to login to the respective Gmail account, Go to More tab and select the Import option. From there browse the CSV file which is created by the tool and after that, all the contacts will be imported in Gmail. 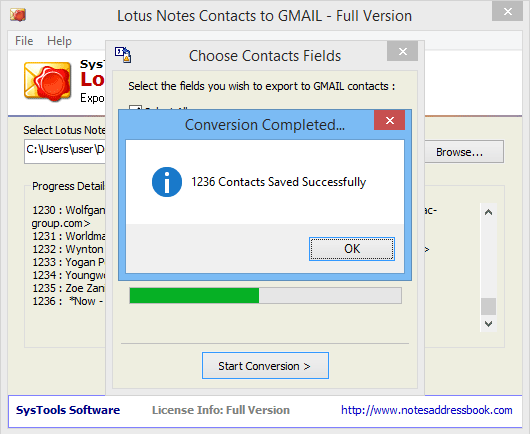 “Hats off to the engineering team to convert Lotus Notes Contacts into Gmail tool. They have made such an innovative product blended with the advanced features that made the conversion of Lotus Notes NSF files to CSV for Gmail very easily. 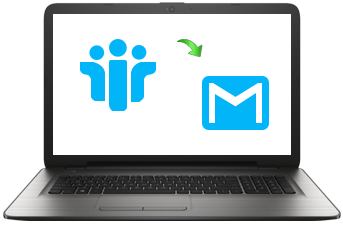 I have trusted this tool many times and it never disappoints"
There are many scenarios in which the IBM Lotus Notes users wants to migrate their data to Gmail. The most important data which is to be migrated by the users is Contacts. The file format in which the IBM Lotus Notes contacts are saved is .nsf file format. So, in that case, the user needs to transfer NSF contacts to CSV file as Gmail supports all contacts list into CSV file format only. 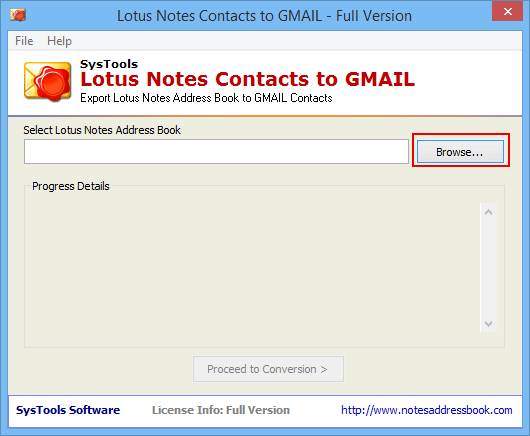 What is the Need of Lotus Notes Contacts to Gmail conversion Tool? The basic need for the Lotus Notes Contacts to Gmail tool arises when the user have to migrate from IBM Notes to Gmail or he might want some of his contacts from Lotus Notes to Gmail. Gmail is comparatively used by many people as compared to the IBM Notes Email client. Scanning and loading multiple contacts from Lotus Notes .nsf file at one time. Unlimited contact conversion from the .nsf file. Easy to migrate from Lotus Notes NSF files into Gmail after the .nsf file has been converted. Sync Lotus Notes with Gmail easily.